This post has been a long time coming! As I’m sure you could tell from the content that I’ve been posting recently, I’ve really taken a stronger interest in beauty and skincare! Maybe that’s because I’ve been so focused on getting my skin to a better place, but I absolutely love trying and talking about new products on the blog! I mentioned before that my skin wasn’t the greatest when the school year ended but now that it’s in a really good place, I think I’ve finally narrowed down what works for me and I’m excited to share those products with you! If you’re interested in my skincare routine, leave a comment letting me know because that’s definitely something I can write about! I pretty much do the same makeup routine every time (if I need to dress it up I’ll add liner and eyeshadow) and these are the products I use! 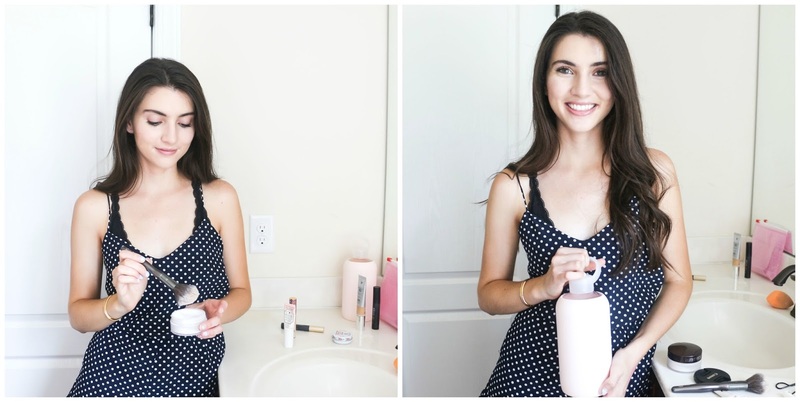 I truly think the most important part of a beauty routine starts with your bare skin! For your makeup to look its best, its needs a good canvas. That means clean and hydrated skin! My skin looks its best when I’m working out and hydrating enough - I love love love my new bkr bottles and while it may seem silly to think that a pretty bottle will help you reach your water intake goal, think again! I have this gorgeous pink glass bottle on my desk at work and I find myself refilling it at least 4-5 times when I’m at the office! I have the full 1L and 500mL bottles and couldn’t recommend them more! Primer - I use to swear by the Smashbox primer but after getting suckered in my the Sephora minis at checkout, this one by Too Faced might be a new favorite! It smells deliciously like coconuts and its a moisturizer like consistency so it blends and sinks right into the skin. I let that dry before I apply anything else. Concealer - While I don’t have many blemishes to cover up, I do have a bit or redness/scars to cover up. I read SO much about the Tarte Shape Tape that I had to give it a try! It was hard to put my trusty Nars creamy concealer away but it was worth it! I make a triangle shape under my eyes and cover the redness and then blend it in with a beauty blender. I would say the Shape Tate is full coverage, meaning it gives my complexion an even base, but its not too heavy! It blends best with a beauty blender but also really well with a brush or just your fingers! Foundation - This CC Cream might be my most favorite beauty find in the past year. I’ve been through so many foundations, BB Creams, CC Creams, tinted moisturizers and I haven’t really been happy with most of them. I tried the It Cosmetics CC Cream from a recommendation from someone at my work and since then I’ve repurchased it already! It’s called the ‘Your Skin but Better’ and I really think the name says it all! I wear the shade ‘Light’ and I think its the perfect match for me right now. It goes on smoothly, has a light citrusy scent, gives you a really flattering finish, and doesn’t break up throughout the day. I have combination/oily skin and I’ve noticed that my makeup still looks great when I come home from work. I appreciate that it has SPF and that its even moisturizing on the skin - I definitely think this product will be great even in the colder months too! Blush - You might remember me raving about the Glossier cloud paints in an earlier blog post and I am still loving them! I absolutely love the shade puff for the summertime…I do a dot on each side and blend it in with my blender or my finger! Setting Powder - I let my face makeup sink in for a few minutes and after that, I’ll use this setting powder to keep my makeup in place! It’s translucent and sits on my skin really well throughout the day. If you have oily skin, you’ll love this product! This one by Neutrogena is a great drugstore one that compares nicely! Brows - You’re probably tired of hearing this by now but I swear by the Glossier Boy Brow to fill and shape my brows. I use the shade ‘brown’ and its great if you want a quick brow fix! Lashes - After curling my lashes with this curler, I do a layer with my all time favorite mascara from Bobbi Brown! I wanted to find a drugstore one to add to my collection and finally settled on this one! I do a layer of this on top and the finished result are full, long lashes! Lips - Finally, I’ll apply one of my all time favorite lip products - this rose salve with mint! It's so hydrating and smells amazing! 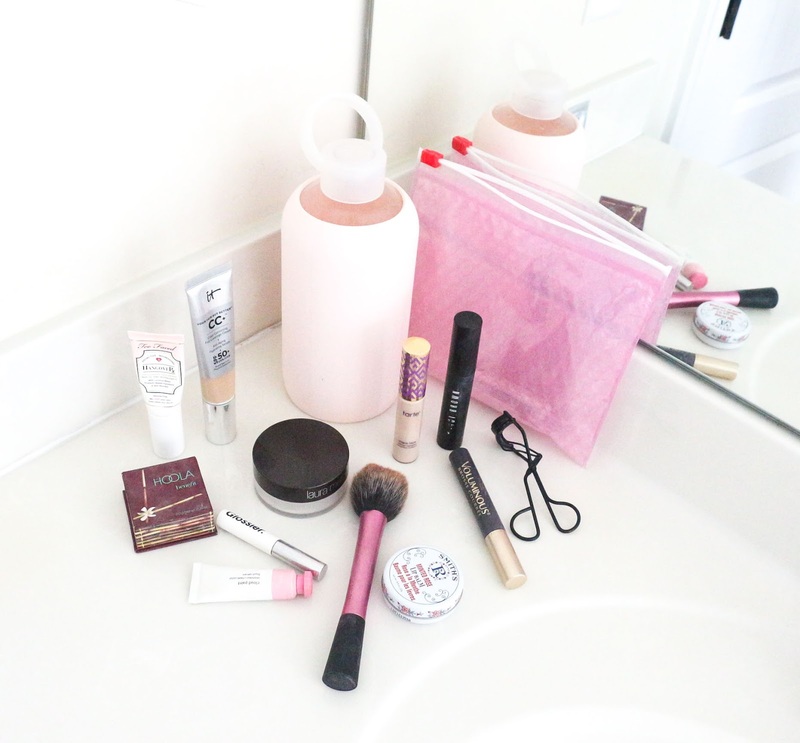 These are all the products I use to create my everyday beauty look! You can shop them below! What are your must-have beauty products? Let me know in the comments! I absolutely adore the Loreal Voluminous mascara! For the price I think it is amazing. I even prefer it to a Sephora brand one I have. And I have to try that cc cream. I have heard great things about it, I think the price point is just giving me a hard time. Isn't that mascara great!? I will definitely be repurchasing! If you're in the market for a new CC Cream, I highly suggest this one! I love it!